I love Zwift. It allows me to get some kilometres done in the safety of my own home with no fear of rain, snow, hail, sunburn, crashes, cars, trucks, vans or pedestrians with headphones on. Right now, it’s probably my primary source of kilometres. Of course, using software so often means I’ve started to become a bit of a Zwift power user. I’ve got tweaked configs and third-party add-ons like ZwiftMap. I also run Zwift on multiple computers depending on where I am and which version of The Paincave I’m using, and because I’m a techie I reinstall my Operating system a lot, and doing that manually is a complete pain. 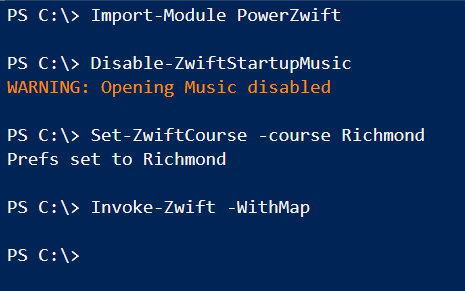 So I wrote some PowerShell code to automate Zwift and make my life a bit easier. Well, I had a bit of free time last night, so I packaged it up, added some enhancements and uploaded some of it to GitHub as PowerZwift, free and Open Source, for other Zwifting techies to use. Switch easily between circuits (“Worlds” in Zwift-speak). 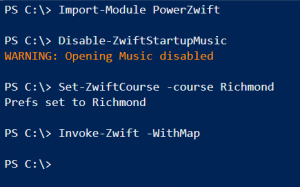 Create Windows Shortcuts to start Zwift in a specific World with one click. If you’re on Windows, you might find it useful. If you’re on Mac or iOS, sorry, but this won’t help you much – but there are lots of hacks for you nonetheless.